The drive through Upstate New York was pleasant (other than the additional tolls). 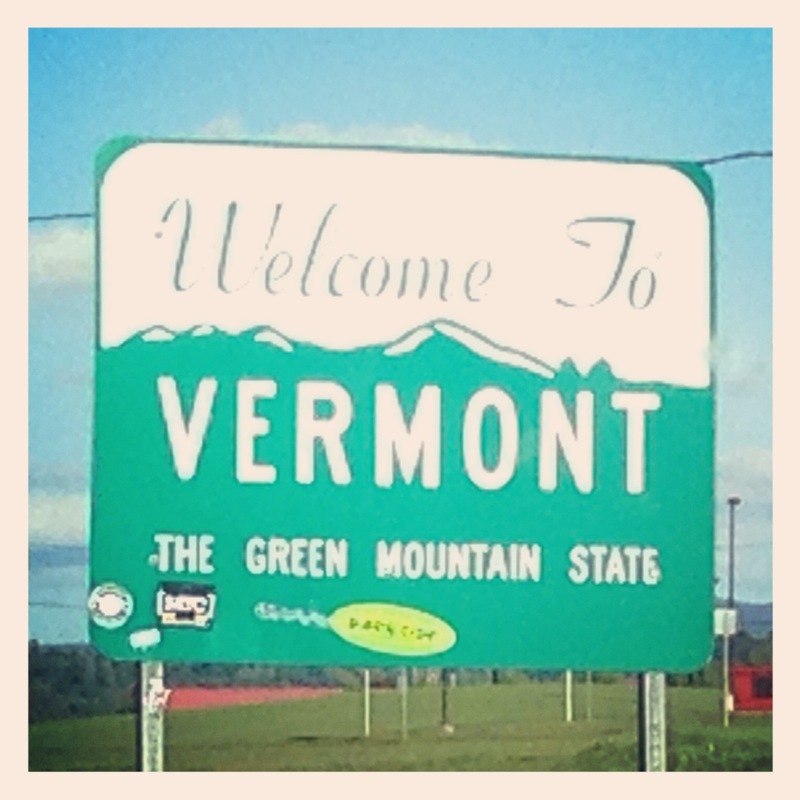 Our next destination is Vermont. Shortly before reaching the state line, we passed through the quaint New York town of Saratoga Springs. Our route took us on Broadway Street, which seemed to be the main thoroughfare as it was bustling with people. They lined the sidewalks as they strolled from one upscale boutique to another, their arms loaded with shopping bags. We loved the energy of the area as well as the charming buildings. If we were going to live in Upstate New York, Saratoga Springs would be our first choice for location. Once in Vermont, we noticed that the colors of the leaves were emblazoned with random splashes of gold and rusty shades. However, the trees were not completely consumed yet by the fiery reds and oranges we had been hoping to see. Apparently, we had arrived too early in the season to witness the vibrant autumn Vermont is famous for. We could imagine how stunning the hilly forests must be at the right time. But despite the lack of colorful fall foliage, Vermont still had a lovely landscape. This helped the long drive through the state. There were no main highways on our course, and we were staying on the eastern outskirts near the border of New Hampshire. After the extremely lengthy drive yesterday, we slept in this morning before venturing out to go sightseeing. 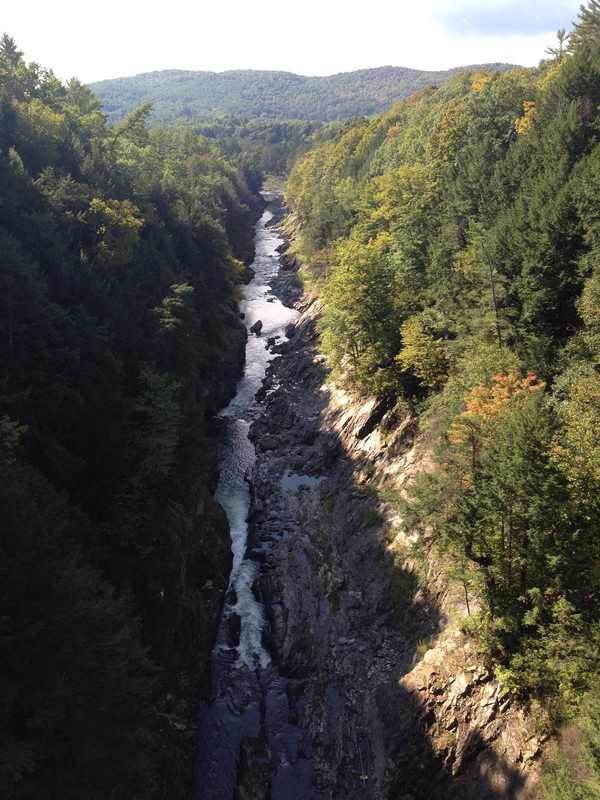 On our way to the nearby town of Woodstock, we stopped at the Quechee Gorge, known as “Vermont’s Little Grand Canyon.” From the road, we had a spectacular view of the deep canyon with the Ottauquechee River far below cutting through the trees. 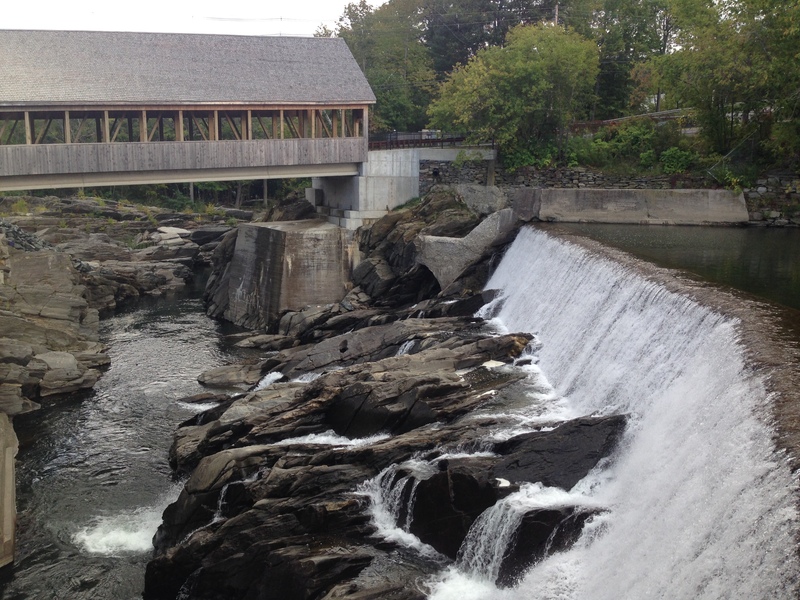 We also took a detour at the Taftsville Covered Bridge, which overlooks a hydro-electric dam. We had noticed several covered bridges the day before while en route to our campground. Vermont has just over 100 covered bridges! We had been given a map of the area when we checked into the RV camp and noticed there were four covered bridges in the vicinity. I made it a personal goal to see all four! Once we reached Woodstock, we wanted to get breakfast in the cute little village. We were hoping to have pancakes or waffles with Vermont maple syrup. However, we quickly realized there were only a few places that served breakfast, and sadly we were too late. Breakfast was already over for the day. Unfortunately, our late start today was a costly mistake. So tragic! 😦 Regardless, we were determined to taste some authentic Vermont maple syrup and had seen signs for Sugarbush Cheese & Maple Farm. They advertised free samples, so we headed there next. Free samples? Yes, please! On our way, we were able to see two more of the four covered bridges! First we went to the one that was furthest away, the Lincoln Covered Bridge, which was a few miles outside of Woodstock. Next we circled back around to Woodstock where we visited the Middle Covered Bridge. We also saw the Taftsville Covered Bridge again from another viewpoint as we traveled back in the direction of the Sugarbush Farm. Seeing the different covered bridges gave me a sense of déjà vu. I swear I’ve seen one (if not all) of them at some point in life as a puzzle or a calendar. Each of the bridges had their own personality and scenic backdrop. 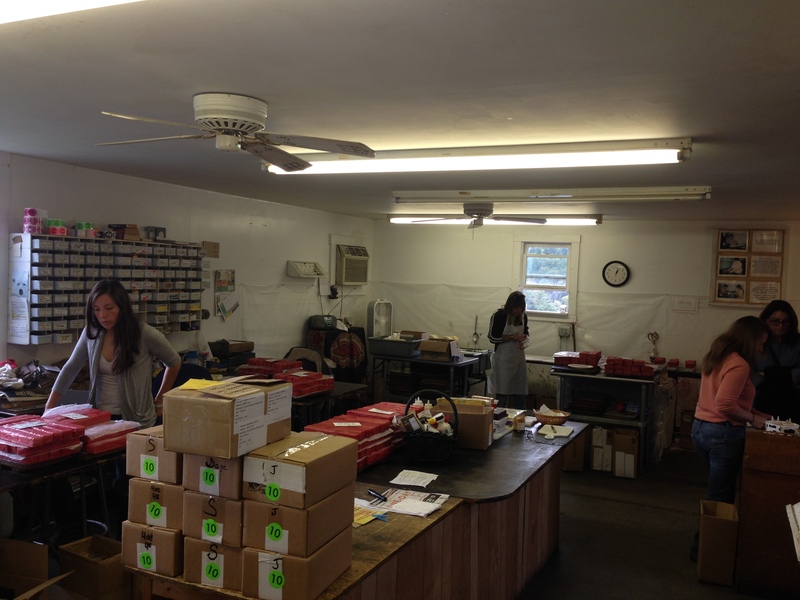 Once at the farm, we entered the work room where the cheese was being hand-wrapped. We were able to try numerous types of waxed cheeses and four different varieties of maple syrup ranging from light to dark. We purchased a block of smoked Cheese with Onion as well as some Grade A Dark Amber (Dark Robust – the third darkest) Pure Vermont Maple Syrup. The cheese was excellent! Also, we have since used the maple syrup for pancakes, and it is by far the best maple syrup we’ve ever had! After getting our fill of cheese and other samples in the farm house gift shop, we continued our quest for the fourth and final covered bridge. We reached the Quechee Covered Bridge in nearby Quechee, VT. With the bridge suspended over the Ottauquechee River next to the falls of the Quechee Dam, I quickly decided that this was my favorite of the four covered bridges. The glassy water in the river reflected the surrounding shrubbery before cascading over the wall of the dam and eventually flowing through the cracks between the boulders below. While staring at the waterfall, we noticed the Simon Pearce Restaurant hanging over the river. We were starving (we never did get breakfast) and knew the view from the restaurant would be amazing, so we decided to have a late lunch there. It was an excellent decision as it ended up being one the best, most memorable meals of our trip. We were seated next to a window overlooking the bridge and falls. As we were enjoying the perfect view from our table, we saw people on a lower balcony outside taking photos. I decided to find the balcony after we ate to see if I could get a better shot of the stunning view. For the first course, we were given a basket of bread including delightful little scone morsels. They were so soft, fluffy and delectable, I had to stop myself from making them my meal! Next we ordered the Jalapeno Fritters for an appetizer. They had a great texture with a slightly sweet flavor and a touch of heat to offset the sweetness. For our entrees, Justin got the Vermont Cheddar Soup with a side salad, and I went with the Pan-Fried Roasted Corn and Ricotta Ravioli. Both were delicious! The creamy soup was incredibly savory with a slight bite to it from the sharp cheddar. But while the soup was excellent, the ravioli was superb! I loved the crispy texture of the pan-fried pasta, and the freshness of the veggies was a perfect balance with the rich, delicious sauce. Such an amazing meal! We also had a great waitress. Overall, the food, the service, the view, everything was outstanding! When we were done eating, we ventured through the building to locate the balcony we had seen people taking photos from earlier. Directly outside of the restaurant was a retail store featuring stunning glasswork. There was also a staircase in the back that we thought might lead to the lower level where the balcony was possibly located. When we reached the bottom of the stairs, we were shocked at what we walked into. It was a glassblowing studio! There were several guys shaping the blazing hot liquid glass into different styles of stemware. Within just a few minutes, a beautiful wine glass had been handmade right in front of our eyes. I’ve always been intrigued by glassblowing and found the entire process fascinating! I could have stayed there all day watching them work. I gradually pulled myself away and stepped out onto the balcony we had been looking for in the first place. The view was indeed spectacular! Brrrr!!! It’s getting cold! When we woke up this morning, the temperature outside was just 39 degrees! Luckily we’ll be heading back down south after we visit Maine. Hopefully we’ll be able to avoid snow and freezing weather! On our way to Maine, we drove back through New Hampshire where we saw more sparse hints of fall with pops of red in the foliage. We really wish our timing had been better for Vermont, so we could have witnessed autumn there in all its glory. But now we have an excuse to go back. Maybe next time we’ll stay at one of the many Bed & Breakfasts in Woodstock, VT. Perhaps then we’ll actually be able to have some Vermont maple syrup with our breakfast! Haha! When we reached Maine, we were excited to finally be back on a coast. Seeing an ocean again was therapeutic. Both Justin and I have already been to a few states on the East Coast, but now we’ll be experiencing every state bordering the Atlantic Ocean! 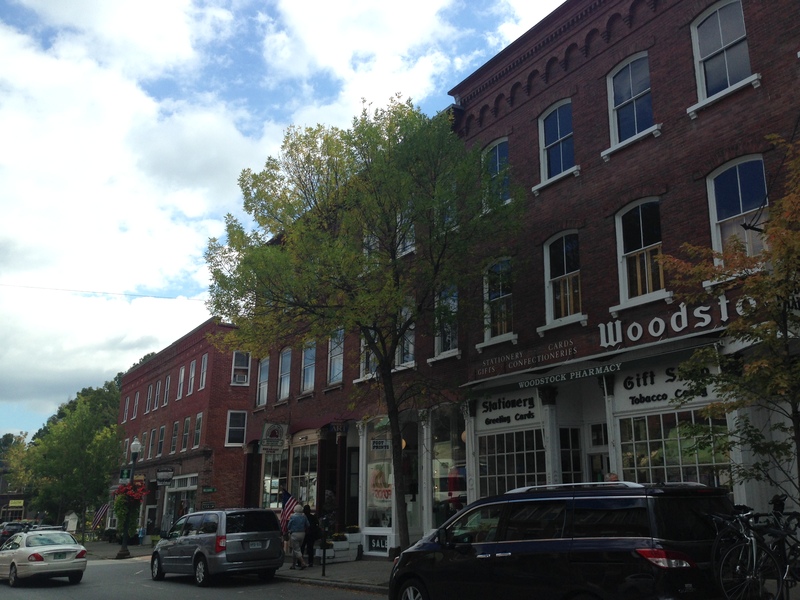 We traveled towards the Northeast region of Maine where we were staying in Bar Harbor. Later in the evening, we went into town to grab dinner. We were in search of a Lobster Roll and the best one at that. Justin had eaten a Lobster Roll in New York when he was there on a business trip. He’s been dreaming about them ever since. Based on online reviews, we chose to eat at the Side Street Cafe. The restaurant was packed, so we ended up sitting in the bar area where there was a guy playing guitar and singing. The live music added to the fun, effervescent ambiance and colorful decor of the eatery. We each ordered a Lobster Roll with a side of clam chowder. While the rolls lacked overall flavor, the large chunks of fresh lobster were still rich and meaty. The other thing Maine is known for aside from lobster is its blueberries. Therefore, we didn’t want to miss out on a few of the blueberry items from the menu. We started with blueberry margaritas, which we had never tried before. We weren’t sure how the Mexican inspired beverage would be with blueberries, but it ended up being quite the tasty concoction. As a finale for our Maine themed dinner, we had blueberry pie. The sugary crust was stuffed with blueberries, rounding out our meal. Before going back to our campground, we drove around for a quick exploration of the area. 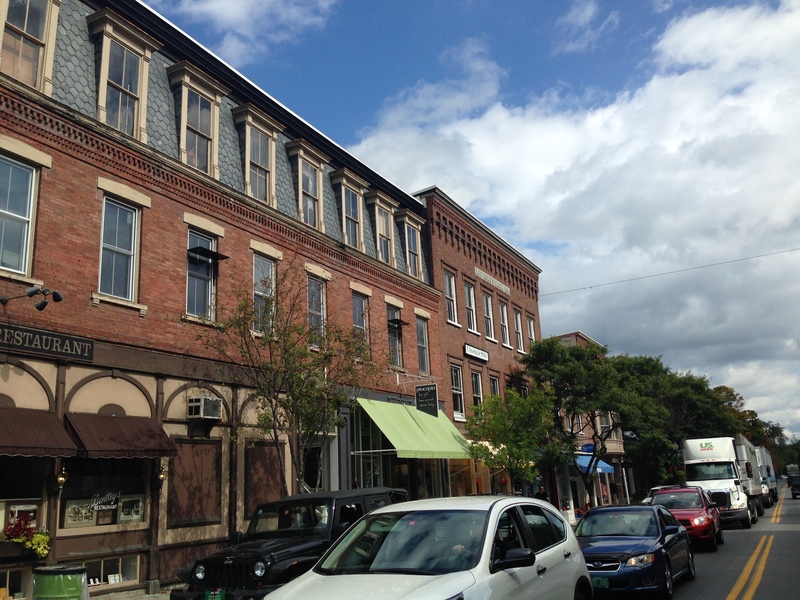 Even in the dark, we could tell Bar Harbor was a darling little seaside village packed with a myriad of restaurants and shops. The popular tourist destination was overflowing with cars and people out and about despite the cold weather. We were looking forward to seeing more during the day. Justin: why didn’t you go to Cooperstown to see the Baseball Hall of Fame? Mikie and I went in Fall 2003 and it was such beautiful country in Upstate NY.